PTFE fiberglass non-stick release liner made of selective fiberglass fabric, with nonstick coating ---PTFE on both sides, as the non-stick coating, cleaning it typically requires little work---you need only wipe or wash away any food or spills once the liner has cooled. It is a tray or pad placed on a bakeware's bottom rack to catch food and liquid spills before the spills can collect and burn on the hard-to-clean cookware bottom. Place in the bottom of the bakeware, the liners are ideal for preparing meat, fish, poultry, eggs, vegetables. Complies with food regulations, it is a very important roasting device that promotes healthier eating, it reduces calories because the liner enables you to roast without adding other fat or grease. High temperature resistance, continuous operating temp from -60~260°C, can be used repeatedly. Non-toxic, safe for use in the dishwasher, safe for contact with food, and anti-corrosion features. 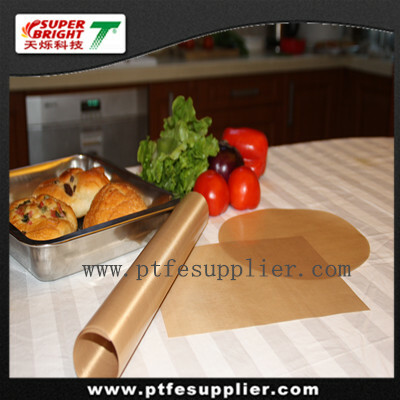 Customized packaging and sizes are welcome, can be cut with scissors to roast the size and shape required, can print pattern according to customer requirements.